Note from Editor: John and Gale Blessing's Anozira RailRoad is a good example of taking Lionel trains outdoors to run. John has also experimented extensively with outside use of a remote control technology that was frankly never intended to be used outside. 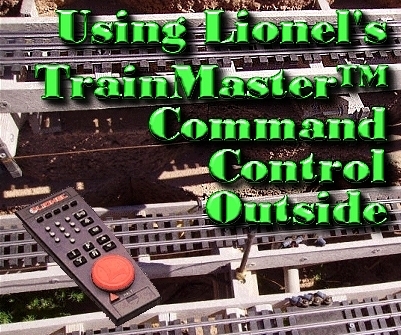 This is Lionel's "TrainMaster Command Control," or "TMCC" for short. If you're not used to remote control technologies, this article may not make a lot of sense to you. The short version is that "standard" TMCC depends on track power, but you don't control the locomotives by turning the voltage up and down like you do on a train set railroad. Instead, the voltage to the track remains at a fairly high level. Each TMCC-equipped locomotive has a little receiver and antenna built inside that responds to TMCC signals that you control using a handheld controller. It is possible to run more than one train on the same track segment using one power supply. But if you want to run a bunch of trains at a time, you will need to have more than one power supply distributing power to the track. Again, the power supplies all stay on at a fixed level (unlike the kind of "blocks" commonly used in HO). Once you hook the power supplies up and turn them up, you ignore them and control each train by the handheld remote control. For more information on TMCC, check out Lionel's downloadable manual on the system. Using TMCC outside to run trains is fairly simple once you do the adaptations recommended by John in this article. Still, if you aren't using mostly Lionel, you might want to investigate one or more of the technologies listed in our article on Large Scale Power and Control. No, TMCC isn't covered in that article, because it's mostly a Lionel thing. But most of what is said about DCC applies, if that helps. Update for 2009 - The verdict is in: the last remaining O Gauge Outsider I know who was attempting to use TMCC to control his turnouts has given up. Gargraves turnouts work fine outside, and if you live someplace where the sun kills black plastic ties, Gargraves will even paint the turnout bases before they put the track on for you. But nobody makes a TMCC-controlled switch machine that hold up long outdoors. The rest of this article is about controlling trains using TMCC, but I wanted you to know it does not apply to switch machines. We now return you to your ordinarily scheduled article. Each block was designed to handle 4 trains at a time without exceeding the 10.5 amp limit of the Lionel PowerHouse supply (although passenger trains with lighted coaches will reduce the number of trains that can be run on one block). Early in our operations, we did exceed the 10.5 amp limit on a single block with three freight consists, going up hill, with loooooong strings of cars in tow. At the time, each engine was pulling its maximum wattage, and the total exceeded the 10.5 limit. But that was a chance event and now we know not to tail-gate so close. Therefore, when you are planning an O Gauge Outside railroad, you should consider that the train density per block will probably be much larger than you would have space for indoors. Yes it is exciting to think, "Wow! I can run a train for more than a 100 feet before it begins to come back!" But the "down" side is that each block may need to be shorter than you might think it should, to avoid having so many trains in the block that you overload the power supply. That means more blocks, which means more power supplies, which translates to more $$. Yes, you could power the entire thing with just one power supply. But that would really limit the number of trains running at one time. TMCC operation in an O Gauge Outside railroad has the same requirements as indoors, with a few additions. One is that TMCC receivers (in the locomotives and accessories) need to be able to sense the true "earth ground." [Think of the "earth ground" as a sort of electromagnetic background field that the TMCC receiver needs to establish a "baseline." - ed.] The onboard computer compares that ground to the TMCC signal. When the ratio is within acceptable range, the engine reacts to the signal and operates properly. But if the onboard computer cannot sense the ground, the engine goes "dumb" and will not operate. This seldom causes problems indoors, where railroads are typically surrounded by plumbing, ground wires running to each wall outlet, etc. Unfortunately, when you are outside, the open sky and boundless vacant landscape do not provide a network of earth ground wires everywhere. The "earth ground" may not be as obvious, especially on a raised railroad like the Anozira RR. Where there is not enough earth ground for the TMCC-equipped locomotives to operate, you need to "help" the earth ground. For lower or ground-level railroads, you can bury a wire just under the track. For broad areas such as towns and switchyards, you can bury wire mesh ("hardware cloth") just under the surface. As an example, the towns on the ARR are sitting on wire mesh. In some cases, where buried wire or wire mesh wasn't enough, we have also placed grounded aluminum foil tape along a concrete block wall adjacent to the track. On a raised railroad you can add telephone poles along the right-of-way, with a continuous solid copper line that is grounded at one or both ends. This is usually the most effective way, in part because the locomotives' antennas tend to be close to the height of the wires. (The antenna is usually located just above the drivers). Anozira RR power lines are 2 each, parallel, bare, stranded, 18 gauge copper wires strung/soldered to one copper cross arm soldered to a copper pole. Although we started out making the poles from wood, we now make the poles and cross arms from 1/4" copper tube, which strengthens the earth ground that an approaching engine's antenna can sense. These are just examples of introducing earth ground for the locomotives to see in an O Gauge Outside/TMCC operation. Regardless of how the earth ground is extended, all of those wires do need to be grounded very well. We used 3/4" diameter, copper clad, 4' long grounding rods driven into the earth for the earth ground system. Some of our locomotives had no problem seeing enough earth ground from the beginning because their antennas are large enough. We had to augment the antennas on some of the other ARR engines (up to 8' of additional on-board antenna) before they could make an uninterrupted circuit through the ARR track system. A substantial earth ground is especially important anywhere an elevated track is close to another track. This includes crossovers and yards. In a crossover situation, the signal emitted by the upper track may blend with the signal broadcast by the lower track. The combination of both signals may confuse the engine's receiver. Providing an earth ground wire between the two track levels helps the lower track to "ignore" the signal coming from the upper track. Sadly, this isn't an exact science. You'll never know for sure how much an upper track is going to interfere with a lower track until you run an engine on the lower track. Some engines are quite sensitive to the upper track interference, while other engines are fairly tolerant. ARR has both types of engines. So anywhere the most sensitive engine's headlight begins blinking wildly and perhaps stalls for no apparent reason, we install an earth grounding wire between the two tracks, usually, a grounded "power line" as described above. This almost always solves the problem. As an example, ARR has one engine that would run through a remote section of track at the far end of our backyard and yet would not run through a particular section of track in the middle of the layout. This track section was 7 feet from the nearest track and at the same level. We installed scale power poles and the problem went away. So sometimes the lack of earth ground or signal interference does not make sense. Another aspect of powering O Gauge Outside is that no O gauge electrically operated accessories or power units are manufactured for outdoor use. On the ARR, anything that operates on house current is stored in a totally protected area. Only low voltages for powering the trains and accessories actually go to the railroad. The "power closet" in the photos to the right may give you some ideas of how to structure your power distribution. Notice that the Lockons, which would be placed around the railroad indoors, are also protected from the weather and only the low-voltage current (with TMCC signal) is actually run to the track. Fred Young's Article: Fred Young's Ground-Level Arizona Railroad, including the September, 2009 addition at the bottom. Fred Young's Ground-Level Arizona Railroad - A ground-level railroad that has lots of operational options and some unique ways of adapting to the Arizona summer sun.